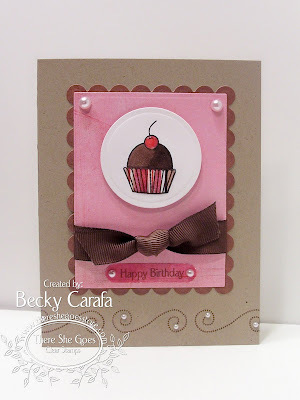 Today I am showing you a sneak peek from the set Cupcake Mix & Match . I absolutely LOVE this set, and I know you will too. Wait until you see the whole thing! I pieced the cupcake holder using BG Bittersweet paper, colored the cupcake and cherry (which are all separate stamps, btw) with copics, and added a clear bubble on the cherry for some shine. The mats are also Bittersweet, and some pearls add the finishing touch. love those pinks and chocolates! Shouldn't cake be chocolate anyway??? I love this card! the scalloped edge is so pretty and what a perfect bow :) The one in the post below with all of the cupcakes is very yummy too! Super yummy card! PERFECT color combo! The more I see it the more I want it. That cupcake is too cute. Can't wait to see the rest of the set. What a yummy-looking card. Beautiful. I love your card. I really like the detailing at the bottom. Another cute cupcake and that color combo is great! Oh, my! That cupcake is fabulous! And so is your card! Cute card. Love the combo. This is so lovely! I love the pearls! Cute card. I love the colors. can't wait to see the full set! your card is super cute! This set is getting better as each blog I visit...love the fact(by your hint) that all pieces are sep. Love pearls as a finishing touch..cute! Oh Becky...this is soooooooo stinkin' SWEET!!! Love the pink & brown with this set...and the swirly pearls at the bottom. I love the pearls and the paper piecing on the cupcake! Great card, I love the pearls! This is so cute, Becky! Love the swirls at the bottom!! Cute cupcake! I love designs that are perfect for paper piecing! I love that the cupcake is so simple!! And for paper piecing too! Sweet! Love the paper piecing. There seems to be a real theme going on here with color. It's a great one! Kate Z. What a pretty cupcake set! Cant wait. Thanks for the sneak peek! This is so CUTE!! Love how you used the swirls!! What a lovely sweet card, Becky! Love the swirl border, too! This is AWESOME Becky! LOVE the colors, your layout and all the swirls! Great card, love the DP and the pearls. Love your coloring and pearl accents. This is so cute I love the kraft paper and the pink! That cupcake though is adorable and I love the beautiful layout! great job! Very nice card! This set is a must have! Love this card. The pearls are great. TFS! Another pink & chocolate combo; I'm in heaven! That cuppie is the cutest little thing; great card. I love cupcake sets and coffee set. This one looks like it's right up my alley. super cute card - I love the color combo and the pearls you used as accents on the bottom. Love it! this set is the cutest!! love the card! love the pink on the craft! Another yummy creation!! This chocolate almost looks sooo real!! Great coloring! !